This looks like it could the latest rover to land on the surface of Mars. But in fact it’s a test of the European Space Agency’s ExoMars mission happening right here on Earth. 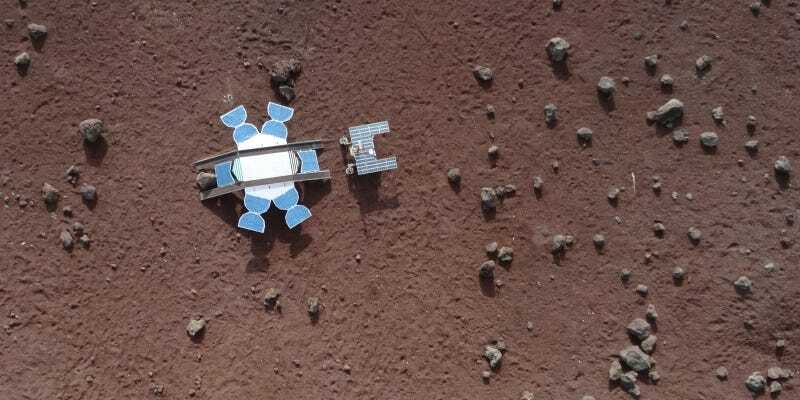 The aerial photograph shows a half-scale model of the ExoMars lander and a prototype rover being tested in the ESA’s Mars Yard in Toulouse, France, last week. Here, you can see the rover attempting to move off its lander — what’s known as an egress test. In fact, it was being controlled by scientists sat at least a thousand kilometers from the site, in a control room in Noordwijk, the Netherlands, where they received only telemetry data and still images to help them drive the rover. Over the course of two days, the teams carried out five simulations of the egress, chalking up four successes and one failure.